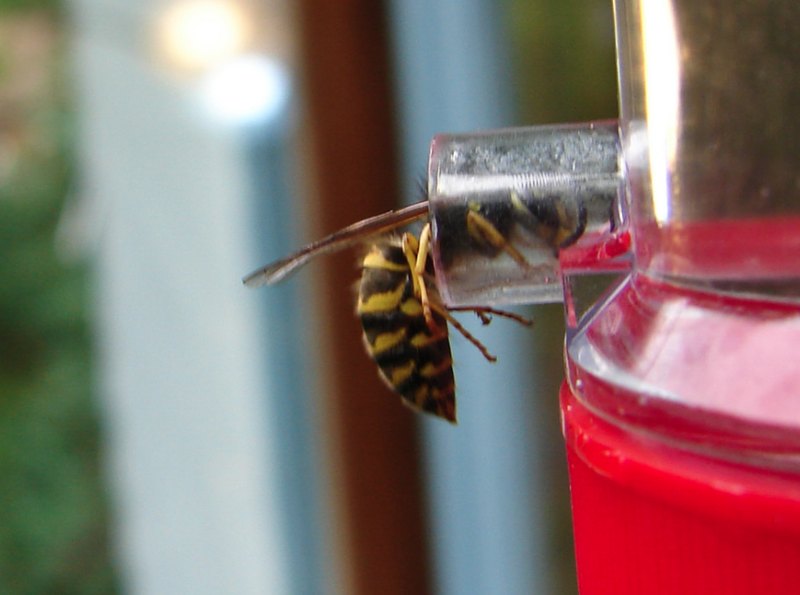 In August, right when hummingbirds are most abundant at our feeders, we can also get inundated with wasps. Wasps pose a danger to allergic people, and also can kill hummingbirds competing for the same food. How can we handle the problem? Some feeders are open invitations to wasps. One feeder design that hummingbirds like but is uniquely hard for wasps to feed at is a dish feeder where the cover is far enough above the sugar water that wasps can't get it out. Some people with these feeders never get wasps at all! Many of these feeders also have a "moat" in the center; when it is filled with fresh water, any ants crawling on the hanging wire can't get access to the sugar water, either. Pennington's 16 oz. and 28 oz. 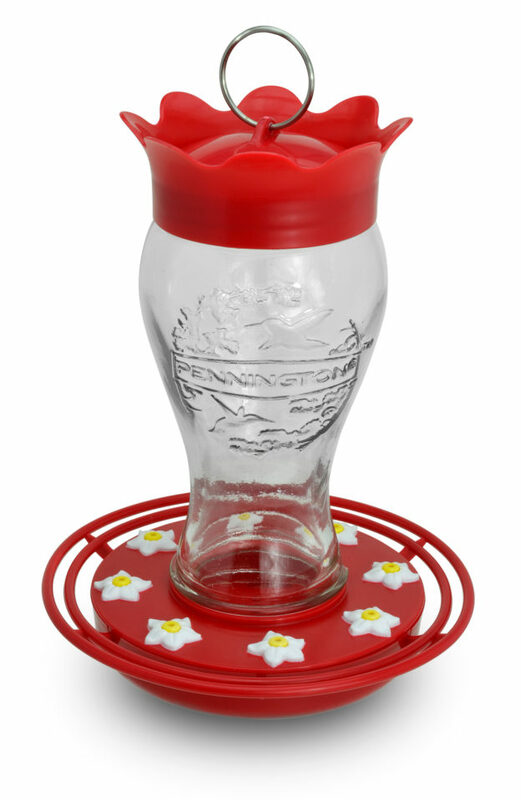 Glass Hummingbird Feeders were developed so the nectar level stays below the port with a sealing between the glass bottle and base to prevent attracting bees and wasps. The port diameter size is sized to prevent bees from climbing into the feeder but big enough so that the hummingbird's beak can get in and get the nectar. There is also a built-in ant moat. You can find this feeder at Wal-Mart, Amazon and other smaller retailers. Buy it now! Hanging feeders with "wasp guards" can actually attract wasps and bees if sugar water drips on those guards. If you have a large yard with an area away from a road or public sidewalk, you may want to try one novel approach that has worked wonders for some people: make one hummingbird feeder especially attractive to wasps! They are creatures of habit, and if they get used to going to one feeder that is designed specifically for them, they may ignore the feeders your hummingbirds are using. How do you make one feeder especially attractive to them? Make the sugar water in that feeder especially strong – a 1:1 ratio of sugar to water is ideal – and also dip the feeder in sugar water to coat the outer surfaces as well.